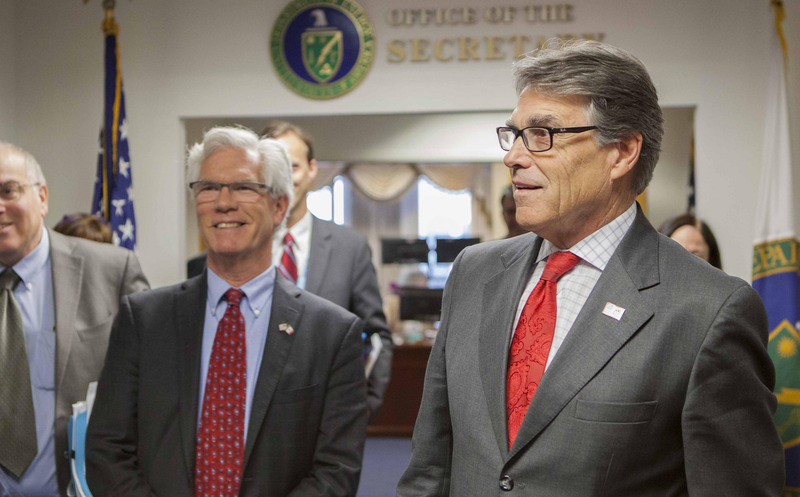 U.S. Energy Secretary Rick Perry, right, met with Canada’s Natural Resources Minister James Carr in March. Rick Perry’s commentary on climate change has bounced around a bit over the years. After hinting earlier this year that he might be growing less dismissive of climate scientists’ conclusions, Perry indicated this week he’s still pretty much where he’s always been on the subject – in science-denial territory. Questioned Monday by a reporter, the former Texas governor and now Energy Department secretary in Donald Trump’s administration sounded off on climate change again. As he has in years past, Perry once again flatly contradicted the core conclusion of the vast majority of the world’s climate scientists – that carbon dioxide pollution from people’s use of fossil fuels is causing planetary warming and other hazardous climate disruptions. Perry was asked on CNBC if he agreed that CO2 is the main force driving current climate change. TCN asked Andrew Dessler, a climate scientist at Texas A&M University who researches the roles of different forms of water in the climate system, if some scientists’ contrarian views might be Perry’s basis for calling “ocean waters” the “primary control knob” for climate change. “This is really run-of-the-mill, unexceptional denial of science,” Dessler replied. “I doubt he’s referring to any cogent hypothesis — at least I’ve never seen any physical argument involving ‘ocean waters,’ etc. He’s probably really just saying it’s mainly natural. At that time, TCN noted that the Intergovernmental Panel on Climate Change (IPCC), the world’s leading scientific body on the subject, has declared it is “extremely likely” that “human influence [mainly CO2 pollution] has been the dominant cause of the observed warming since the mid-20th century.” More than 200 major scientific societies around the world support that finding. The IPCC defines “extremely likely” to mean 95 percent certain, about the same level of certainty that medical scientists profess in saying smoking causes cancer. Perry’s stated disagreement with all of those experts in dozens of nations may have come as at least a mild surprise to those who noted what he had to say earlier this year when the Senate was considering his nomination to lead the Energy Department. Given Perry’s previously and uniformly derisive comments about climate science, even an acknowledgment of some man-made component in climate change seemed to signal he might be moving in a pro-science direction. He had said in Fed Up, a 2010 book written to promote his chances in the 2012 presidential election, that climate science was “all one contrived phony mess.” He added in the book that the earth was actually experiencing a “cooling trend” – not man-made global warming, as the nearly universal consensus of the international scientific community holds. He retreated from such bold counter-scientific claims during Senate questioning in January when asked how much of the climate change scientists are documenting he thinks is human-caused. Judging from his “ocean waters” claim on CNBC this week, Perry is once again not reluctant to answer such questions now that he has joined the Trump cabinet.